Offer small songbirds a meeting place in your yard with the Heartwood Turquoise Twitter Junction Bird House. The bright copper, curved roof brings a whimsical hint to this piece, while the vivid, light blue paint will certainly brighten any garden. The frame of the roost evokes a horseshoe, with its rounded top and slightly tapered base. The inset, front panel of the home is routed to indicate siding, and a 1.375" diameter entry hole allows small birds to use the item. A slot on the base of the shelter drains captured water, and gaps at the top keep it properly ventilated. Hang this house from a bracket using the eyehook at the top, and remove the back disc for seasonal cleanings. The wooden construction lends a natural hint to the piece, and will certainly enhance any setting. 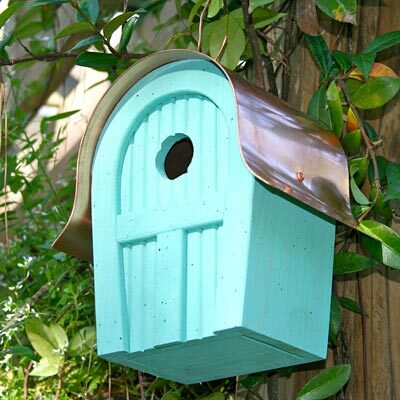 Bring birds a fun shelter using this Turquoise Twitter Junction Bird House. Made in the USA.